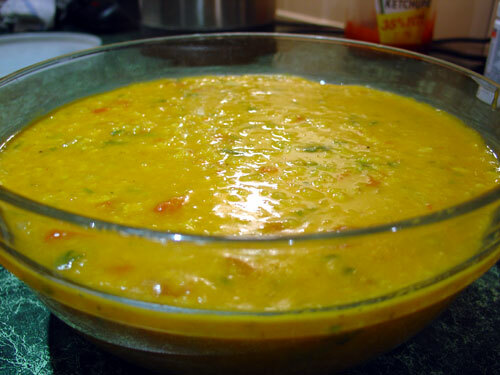 Dal Tadka aka Tadka Dal or Dal Tarka is a healthy, hearty, beautifully textured, smoky flavored Indian dal dish that is revered by many a Dhaba food connoisseur. The aroma that emanates the home while preparing the tadka for the dal dish is something one needs to experience as I cannot explain in words the sizzle and mingle of Indian spices in hot oil or desi ghee. Truly intoxicating. Wash dal properly and pressure cook it in water. Add more water, if necessary, to prevent drying out. Remove the cooker from the flame after 2 whistles. Heat the ghee in a frying pan and add jeera. Fry it for a minute on medium heat. Mix green chillies and ginger. Fry again for about 2 minutes. Add onions now and fry them till they turn light brown. Now add tomatoes and fry for about 10 minutes. Put salt and coriander leaves. Mix well and fry for a minute. Mix the prepared gravy into cooked dal. Put it in pressure cooker and cook again for 1 whistle. Serve with chapatis or plain rice.